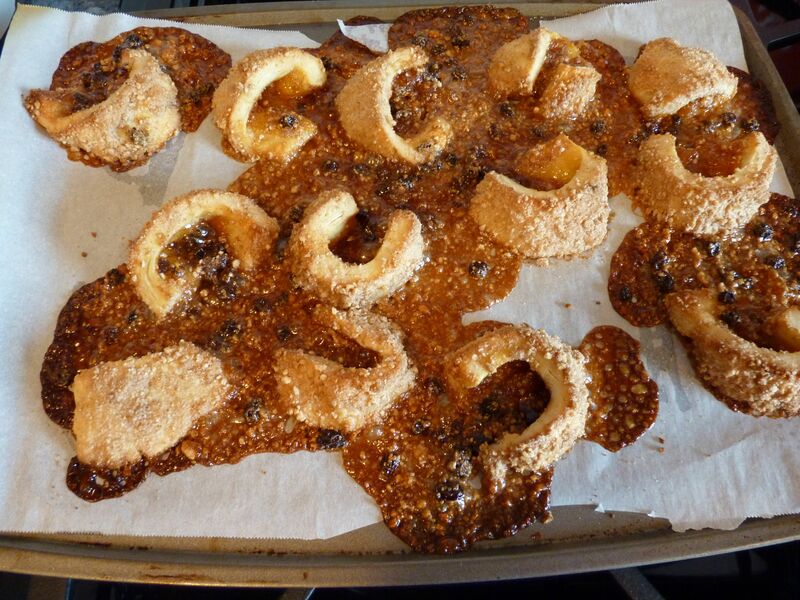 The Tuesdays with Dorie group tackled Rugelach for the group’s first March recipe. I’ve made rugelach once before; in fact, it was the first recipe I made for the Tuesdays with Dorie group back in November 2008. Here I am making it again a couple of years later and guess what…I really messed it up! They smelled fantastic, but what a mess! The filling that’s all over is apricot jam and currants. Some things I know I did wrong, like putting some of the nut/sugar/cinnamon mixture inside the rolls when it’s supposed to go on the outside (it went on the outside too, and I still had a ton left over). But I don’t know why they unrolled and lost most of their filling. I’ll have to read some of the other group members’ blogs to see if I can get any tips. Some filling was still there, because my husband described them as “a cinnamon roll with a classy center.” I thought they were very tasty, and I especially liked the cream cheese pastry. You may have better luck with this one! You can find the recipe on page 325 of Baking with Julia. This recipe is hosted by Margaret and Jessica. why yes, my filling did the same thing! At least they are yummy! I agree, the important thing is that they were good. And I felt very thankful for parchment paper. I would not have wanted to clean my pan after baking those babies! Remember our first recipe with this group, the white loaves? My yeast was dead, I’m sure of it. But, the loaf tasted really good, despite how dense it was. One of the best chocolate cakes my Mom ever made, slid sideways in the refrigerator and cracked in the middle. It was delicious. The important thing is that this was delicious…and I bet the caramelized goodness on the bottom was to die for! I can imagine dragging some of the dough through that goodness right now! YUMMMM!!!!!! Totally agree, juju! The only thing that matters is the yummy taste! 🙂 Thanks for baking along with me this week, Jill! Your first photo actually looked good! And it sounds like the flavors were wonderful. It’s always disappointing when something doesn’t turn out the way you hoped, but as long as they’re still edible, all is not lost! I new from previous kitchen disasters to press the rolled ends together then get the egg wash on the connecting point to help seal it. If I had been thinking I would have posted that on the P&Q page. The good taste is what matters most though! Lola, I was going to suggest the same thing. I had to do that as well. I am sure they tasted great! I found for myself that keeping it in the fridge for 24 hours was a very good idea, they held together perfectly! Mine completely unraveled in the oven, too, and looked very similar to yours. They were delicious though! I think they stayed together better if you pinched everything in after slicing. They were tasty though! Your rugelach look fine to me – they look like great roll shapes in the first photo, and I’ll bet the others tasted really good. I think the only time I’ve made rugelach was for TWD too, but I really liked them. 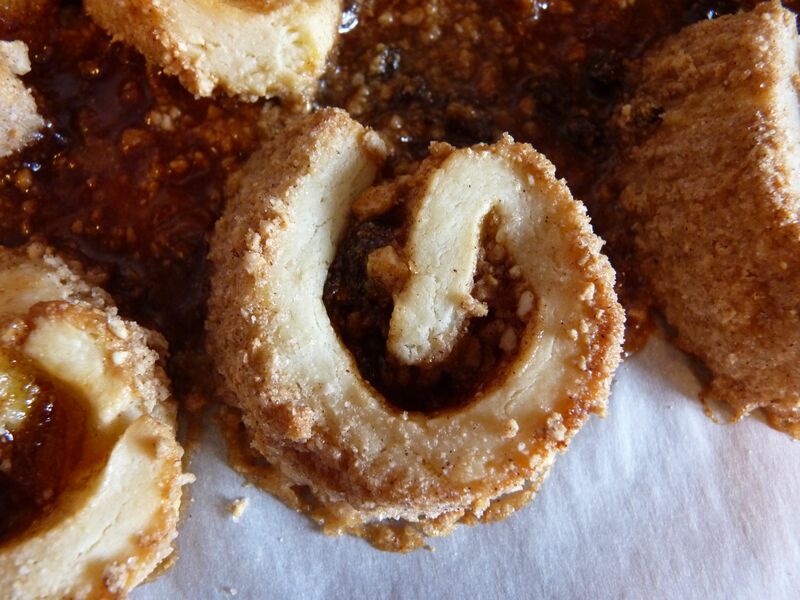 I was thinking how gorgeous your rugelach turned out so it was funny to scroll down and see the rest of the pan – love that you showed us. Glad they were tasty! If they tasted good, that’s all that matters! So sad! I hate when complex recipes don’t work out–it makes me irrationally cranky. 🙂 Glad they still tasted good, though! Oh no! I hope you try again, they are so worth it! Sorry about the filling explosion! They still look good though.